The NCS0402 is a ready-to-use network connectivity platform intended for combined ethernet and GSM network connectivity applications. It also contains a serial port (RS232/RS485). The NCS0402 integrates an ID1021 module and a Siemens GSM modem, therewith enabling both local ethernet access and remote wireless access using a GSM network. Web interface for OEM product that can be accessed locally over ethernet and remotely over the internet (GPRS). GPRS-to-Ethernet bridge, for enabling wireless internet access to OEM device with ethernet interface. GPRS-to-Serial bridge, for enabling wireless internet access to OEM device with RS232 or RS485 interface. Remote control/configuration of OEM product using ethernet and/or SMS, GSM data or GPRS. Bridging/tunneling of existing RS232 or RS485 protocol over GSM data/GPRS. Remote servicing/upgrading of OEM product firmware/software/databases via GSM network. Remote data acquisition & logging over GSM, periodic retrieval of data using FTP (GPRS). Click here for more details about the Necoso connectivity solutions that are based on the NCS0402. A dual-band GSM antenna, with 2.5 m coax cable. AC/DC power adapter for converting mains to 9V DC. Dedicated OS that provides resource management and scheduling services. Supports multiple concurrent applications. Application Programming Interface (API) is available for writing your own applications. TCP/IP stack that includes Ethernet v2.0, IEEE 802.3, ARP, IP, ICMP, UDP, TCP, NetBIOS, DHCP, telnet, HTTP, FTP. Embedded file system for flash EEPROM, serial EEPROM and (optional) RAM disk. Run-time accessible with FTP. 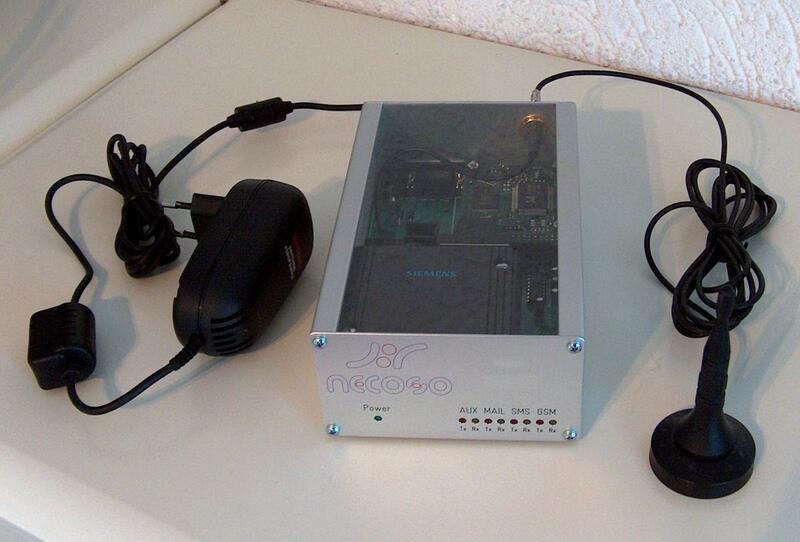 Necoso GSM Application Suite for SMS, GSM data and GPRS. APIs are available. All documentation is available in electronic format (MS-Word) and can easily be customized for OEM product. The NCS0402 is available as a ready-to-use protocol convertor. Necoso has realized software applications for the most commonly used GSM / ethernet / RS232 / RS485 protocol conversions. The protocol conversion application will be pre-installed on the flash disk of the ID1021. Click here for more details about the ready-to-use Necoso protocol converters. The NCS0402 is also available as an OEM platform for realizing your own boxed network connectivity solutions or protocol converters.